Thank you for visiting the Jenny Craig Website (Site). Please read these Terms carefully before accessing or using the Site, as your access and use of this Site are subject to these Terms and Conditions (Terms), and by using the Site, or any of its contents, you agree to comply with these Terms. You must not use this Site if you do not agree with these Terms. 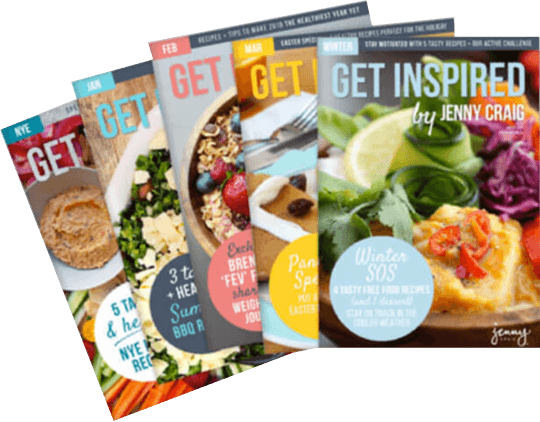 Throughout this Site, the term “Jenny Craig”, “our” or “we” refers to Jenny Craig Weight Loss Centres Pty Ltd ABN 61 006 109 842, the terms “you” or “your” refers to any person accessing and/or using this Site and the term “us” refers to both us and you. If you are under 18 years of age, then you must obtain your parent or guardian’s consent before accessing and using the Site. Information sent by you through this Site may not be encrypted and we therefore cannot guarantee the security of such information. It is your responsibility to satisfy yourself whether the security measures are sufficient for your requirements. When you disclose, submit, transmit or offer any non-personal communication or material to this Site, including information, data, photos, videos, text, graphics, questions, creative suggestions, messages, comments, feedback, ideas, recipes, notes, articles, stories or any other material (Comments), then the Comments are, and will be treated as, non-confidential and non-proprietary, and will become the property of Jenny Craig. Jenny Craig may use the Comments for any purpose, including but not limited to reproduction, disclosure, transmission, publication, broadcasting, posting, developing, manufacturing, advertising and marketing of any products, recipes, ideas, artwork, inventions, developments, suggestions or concepts, without compensation to the party submitting the Comments. By submitting any information, including the Comments, you also warrant that you own the material and the content submitted, any person depicted as consented to such use, that it is not defamatory, and that our use will not violate any third party’s rights or otherwise place us in breach of any applicable laws. For the avoidance of doubt, Jenny Craig is under no obligation to use the information or Comments submitted. All copyright, trademarks and other intellectual property rights in all proprietary pages, product names, menus, recipes, designs, images, photographs, videos, text, words or phrases, and any other material contained on or within this Site (Content) are the property of Jenny Craig, or are included with the permission of the relevant owner. Nothing contained on this Site should be construed as granting any license to use any trademarks displayed on this Site. This Site may contain links to other external websites outside of Jenny Craig. Jenny Craig is not responsible for the function, content, accuracy or opinions expressed in such third-party external websites. Any external links available on this Site are provided by Jenny Craig in good faith, however such external websites are not investigated, monitored or checked for accuracy or completeness, and therefore Jenny Craig cannot be held responsible for any changes. The inclusion of any linked external websites on this Site does not imply consent, approval or endorsement by Jenny Craig of such external site. If you decide to leave our Site or access third-party external websites, you do so at your own risk, and we recommend that you make yourself aware of, and read carefully, the legal and privacy notices of all other websites that you visit. You acknowledge that your use of this Site is at your own risk, and that you must exercise your own personal judgment and responsibility when using our Site. You may only access and browse this Site for lawful, personal and non-commercial use, unless Jenny Craig provides prior express written consent. p. results in your use of the Site in any way that otherwise breaches these Terms. e. any advice or opinion obtained from Jenny Craig through this Site will be accurate. Any products, images and designs on this Site are for visual representation only. You may stop using this Site at any time for any reason. We reserve the right to restrict, suspend or terminate your access to this Site, or part of this Site, or any feature of this Site, at any time, without notice to you. Jenny Craig may disclose any information it has about a user in relation to an investigation or allegation that your use of this Site is in breach of these Terms, or is in breach of any law or regulation, and reserves its right to identify or bring legal action against any person who breaches these Terms, including obtaining injunctive relief. Except to the extent prohibited by relevant applicable laws, Jenny Craig will not be liable to you for any loss, damage, liabilities or claims and expenses that you may suffer due to your use of this Site, including use of any information or Content on it. You use the internet, any third-party websites, and the Site at your own risk. Jenny Craig may vary these Terms at any time, and by continuing to use the Site you consent to any variations. We will not notify of these variations and it is your responsibility to regularly check these Terms for any variations. This Site is intended for Australian users and customers only. Therefore, this Site may contain Content, material, promotions, offers, information, designs, products and services that are not available, or applicable, in other locations. Please contact your local Jenny Craig Centre to obtain more information about material, promotions, offers, information, products and services that are available in your location. You agree that any controversy or claim arising from, or pertaining to, the use of this Site shall be governed by the laws of the State of Victoria, Australia. You therefore submit to the non-exclusive jurisdiction of the Courts of the State of Victoria, Australia.